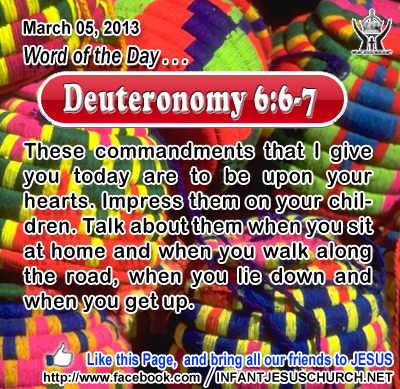 Deuteronomy 6:6-7: These commandments that I give you today are to be upon your hearts. Impress them on your children. Talk about them when you sit at home and when you walk along the road, when you lie down and when you get up. Heavenly Father, Gracious Sustainer, thank you! Thank you for this breath we take and for the heartbeat that sustains our life. Make us aware as we travel and talk and rest and work that you are there and are worthy of our intentional best. The name of Infant Jesus, our gracious sacrifice we pray. Amen. 21Then Peter came up and said to him, "Lord, how often shall my brother sin against me, and I forgive him? As many as seven times?" 22Jesus said to him, "I do not say to you seven times, but seventy times seven. 23"Therefore the kingdom of heaven may be compared to a king who wished to settle accounts with his servants. 24When he began the reckoning, one was brought to him who owed him ten thousand talents; 25and as he could not pay, his lord ordered him to be sold, with his wife and children and all that he had, and payment to be made. 26So the servant fell on his knees, imploring him, `Lord, have patience with me, and I will pay you everything.' 27And out of pity for him the lord of that servant released him and forgave him the debt. 28But that same servant, as he went out, came upon one of his fellow servants who owed him a hundred denarii; and seizing him by the throat he said, `Pay what you owe.' 29So his fellow servant fell down and besought him, `Have patience with me, and I will pay you.' 30He refused and went and put him in prison till he should pay the debt. 31When his fellow servants saw what had taken place, they were greatly distressed, and they went and reported to their lord all that had taken place. 32Then his lord summoned him and said to him, `You wicked servant! I forgave you all that debt because you besought me; 33and should not you have had mercy on your fellow servant, as I had mercy on you?' 34And in anger his lord delivered him to the jailers, till he should pay all his debt. 35So also my heavenly Father will do to every one of you, if you do not forgive your brother from your heart." God's compassion towards each one of us shows us the way that God wants each one of us to be merciful towards one another. When Peter posed the question of pardon and showing mercy to one's neighbor, he typically offered an answer he thought Jesus would be pleased with. Why not forgive your neighbor seven times! How unlikely for Jesus to counter with the plan that one must forgive seventy times that. Jesus made it clear that there is no assessable limit to mercy and pardon. And he drove the lesson home with a parable about two very dissimilar kinds of debts. The first man owed a huge sum of money - millions in our currency. In Jesus' time this amount was greater than the total income of a province - more than it would cost to ransom a king! The man who was forgiven such an unbelievable debt could not, however bring himself to forgive his neighbor a very small debt which was regarding one-hundred-thousandth of his own debt. The contrast could not have been better! Loving Infant Jesus, make us an instrument of your peace. Where there is hatred let us sow love. Where there is injury let us sow pardon. Where there is doubt let us sow faith. Where there is despair let us give hope. Where there is darkness let us give light. Where there is sadness let us give joy.